What: Dehydrocoupling is the formation of a new main group metal-metal chemical bond with formation of hydrogen gas from a hydride with a suitable catalyst (recent review DOI). 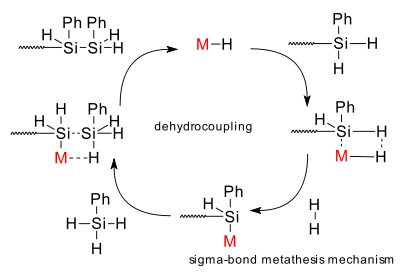 A type of dehydrogenation. First observed in dimerization of pentaborane by action of Platinum(II) bromide (Corcoran & Sneddon 1984 DOI). First silicon bond formation with (Aitken et al 1985 DOI) polymerization of phenylsilane in presence of the Petasis reagent to polyphenylsilane (DP around 10). In a similar way polystannanes of the type (RR'Sn)n can be formed (Tilley et al. 1995 DOI). Reaction of phenylphosphine with organozirconium catalyst Cp*2ZrCl2 and KH gives the cyclic pentamer (Stephan et al. 1995 DOI). Mechanism: a sigma bond metathesis reaction mechanism is postulated for the polysilane formation reaction. Preceded by: Wurtz-Fittig reaction , coupling of elements through the halide and not the hydride. Disadvantages : use of expensive halides, handling of alkali metals. Scope: One particular dehydrocoupling is in vogue as hydrogen storage solution: the reaction of amino borane (Denney et al. 2006 DOI) with an organoiridium pincer catalyst to an cyclic aminoborane oligomer with quantitative formation of hydrogen. Most recently in 2008 using the same catalyst a practical synthesis was reported for linear high molar mass poly(N-methylaminoborane) (NHMeBH2)n (Staubitz et al. DOI).